For earlier posts in this series, click here. 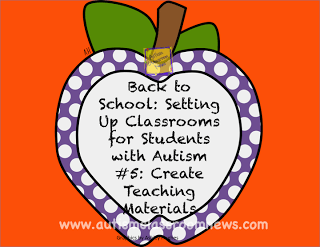 We have come to the last step in the classroom setup: creating teaching materials. Clearly this is an ongoing activity of the classroom development, but I wanted to talk about some general topics to think about in developing materials for teaching and share some examples over the next few posts. 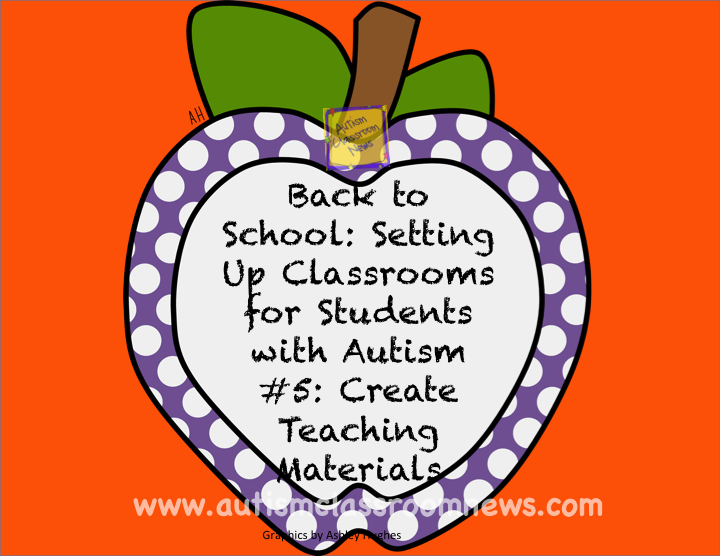 First, the materials you develop will be based on the curricula you are using and the students’ IEP goals. 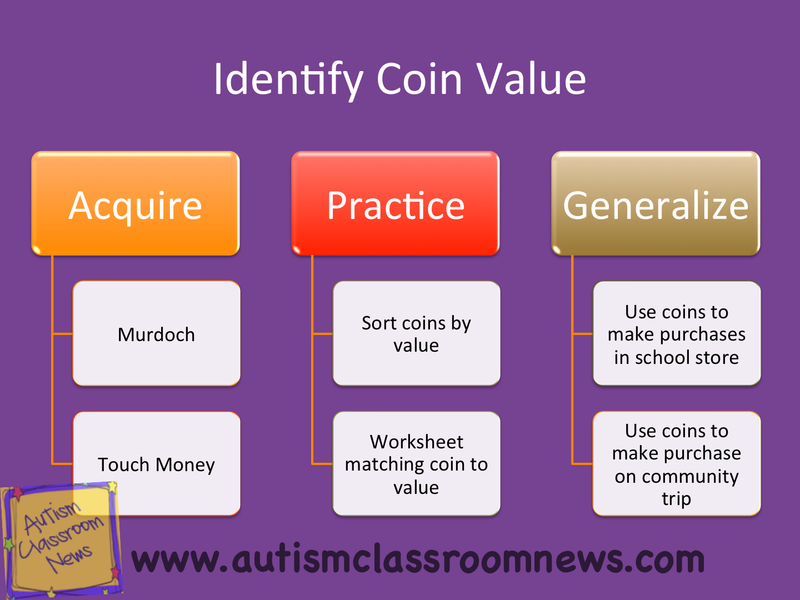 I talked about common curricula in one of the posts of the top 12 tools of a successful autism classroom. Some curricula come with materials and some you have to develop yourself, but that’s the best place to start. 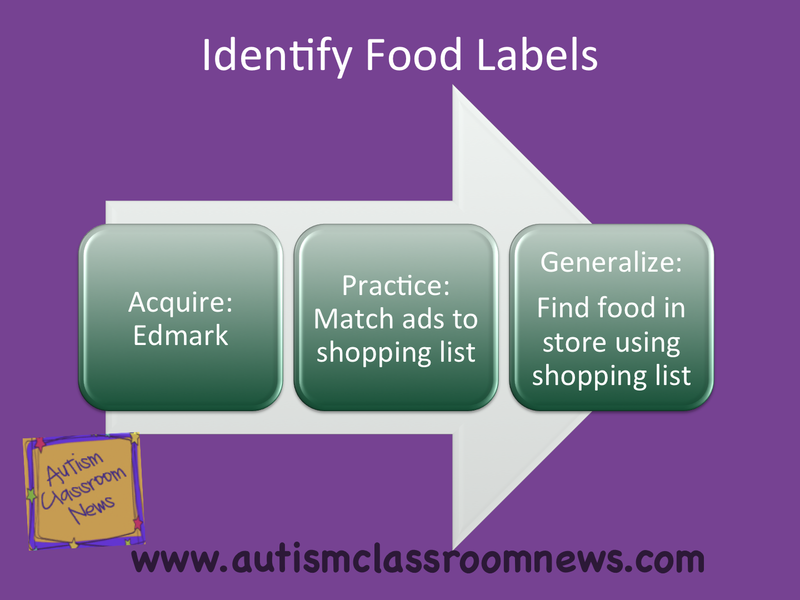 Then, the CAPS that you did at the beginning of the classroom set up process will be your resource to find a list of the types of activities that the students need based on their IEPs. Second, the materials have to be developmentally appropriate. This means that they have to match the level of functioning of the students. Teaching with materials that are too advanced (or too basic) for students is a sure way to have them become frustrated with tasks and disengage from the process of learning. 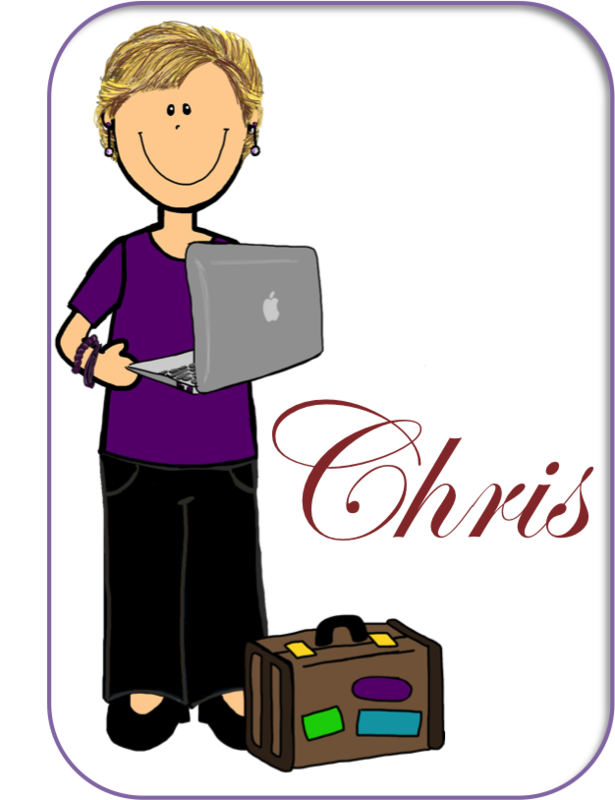 Use your curricula to tell you what the student’s level is in specific areas and plan your instruction around that. 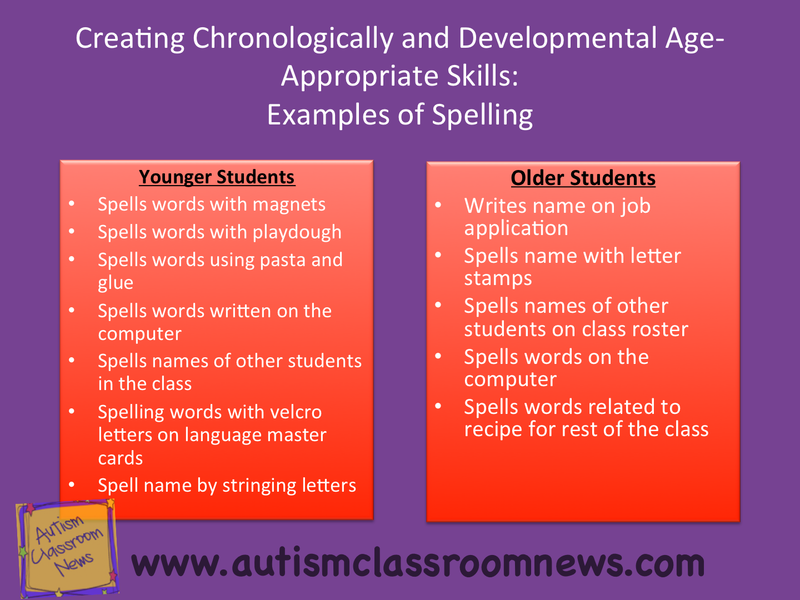 Third, while assuring that the tasks and materials are developmentally appropriate, you have to make sure that they are chronologically appropriate. 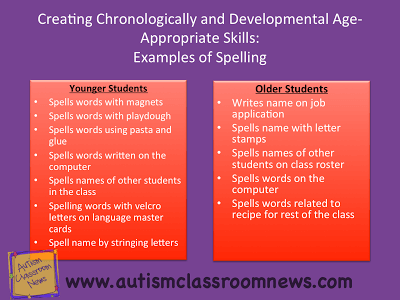 This means that younger children get younger materials and tasks and older students get older materials even though they might be working on the same type of skill. You really don’t want the other high school students to think of your class as the “baby class.” This takes a significant amount of creativity, particularly for older students. Below is an example. And finally, you want to think about how to teach each skill depending on the student’s level of mastery. I think of this as 3 phases. Acquisition, Practice and Generalization. Acquisition typically involves explicit instruction either in a smaller setting or embedded meaningfully in natural environments. These might be what is taught in the teacher time or direct instruction activities or other explicit instruction times of the day. Practice is the opportunity to practice the skill multiple times. This might be done in independent work, structured work systems, or during group activities. And finally, Generalization means that the student is using the skill in the natural environment or with different people, materials or places. This is a key element that has to be planned for with students on the spectrum. We have to teach lots of examples and often have to teach in the environment where skills will be used to assure that generalization happens. As I like to say, if I can’t use the skill when I need it, why did I learn it? Below are a couple of examples of how I see skills translated in the classroom through these phases. The Murdoch refers to the Murdoch Program Library that uses task analysis to teach functional skills. Edmark in this instance refers to the Functional Word Series. So, over the next few posts I’m going to share some ideas for creating materials when your budget is low (or nonexistent). So get ready in the next few posts for pictures, ideas and at least one freebie. In the meantime, what are some of your favorite tasks to use with students in your class? DecodingMyAutism.com is our website to try and help parents and children living with Autism in their lives. We are focused on delivering you the best book we can possible create. When you think of a sunny day and your child is happy, but their is always that thing you should mention. Or that little factoid that could make the difference between an awkward moment and a delightful experience. What do I truly need to know to take care of your child for an hour or two?